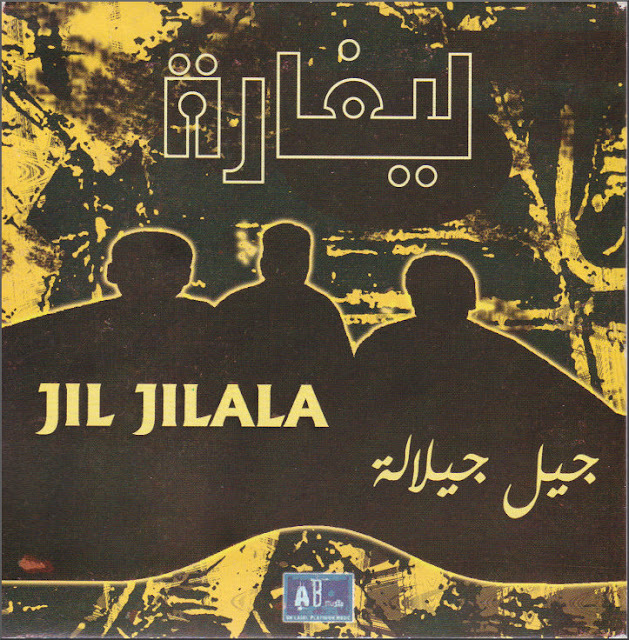 Moroccan folk revival band Jil Jilala provides the accompanying CD artwork. 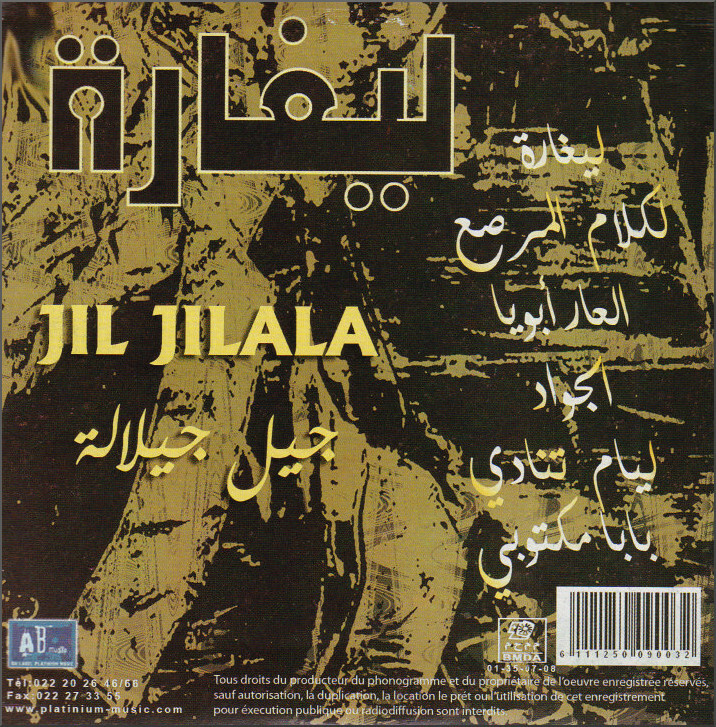 Both Jil Jilala and their better known contemporaries Nass El Ghiwane rose to prominence in the early 1970s by capturing the zeitgeist of the young Moroccan state which was freed from its French protectorate status in 1956. There are many similarities between Jil Jilala and Nass El Ghiwane, and, in fact, the bands have exchanged personnel over the years. Both bands evolved from improvisatory theatre groups, and both were pioneers of the Moroccan folk revival which speaks a contemporary musical language but which, conversely, is rooted in the ancient mystical healing traditions of the Mahgreb. But there are nuanced differences: Nass El Ghiwane has its roots in the animistic Gnawa music of Black Africa, whereas Jil Jilala is influenced by the Sufi music and rituals of the Jilala Sufi brotherhood. Nass El Ghiwane are better known outside Morocco because of their Peter Gabriel curated contribution to Martin Scorses's controversial 1988 film 'The Last Temptation of Christ', while Jil Jilala became Moroccan folk heroes with their song Laayoune Ayniya - see video below - written for the 1975 Green March whereby Morocco illegally occupied, and continues to occupy, the disputed territory of Western Sahara. In our click culture where music tastes are defined by the buzz of the social media hive mind, music that falls outside the mainstream traditions is becoming increasingly marginalised. Which is quite wrong, because there is much we can learn from the musical margins. Both Jil Jilala and Nass El Ghiwane evolved in a society where the healing and therapeutic power of music is valued, and the cut-aways to the audience in the video above show the transformative power of this music. But as the Western classical tradition struggles to define a role for itself, leveraging the transformative power of classical music remains a missed opportunity. In his preface to Omar Sated's sumptuous tribute to Nass El Ghiwane, Martin Scorsese describes how the band's music "opened my eyes and ears, inspired me, move me, and transported me; it has deepened my sense of the mystery of being alive". Deepening our sense of the mystery of being alive is not a bad objective for any music, whether it be from Morocco or the Western world. 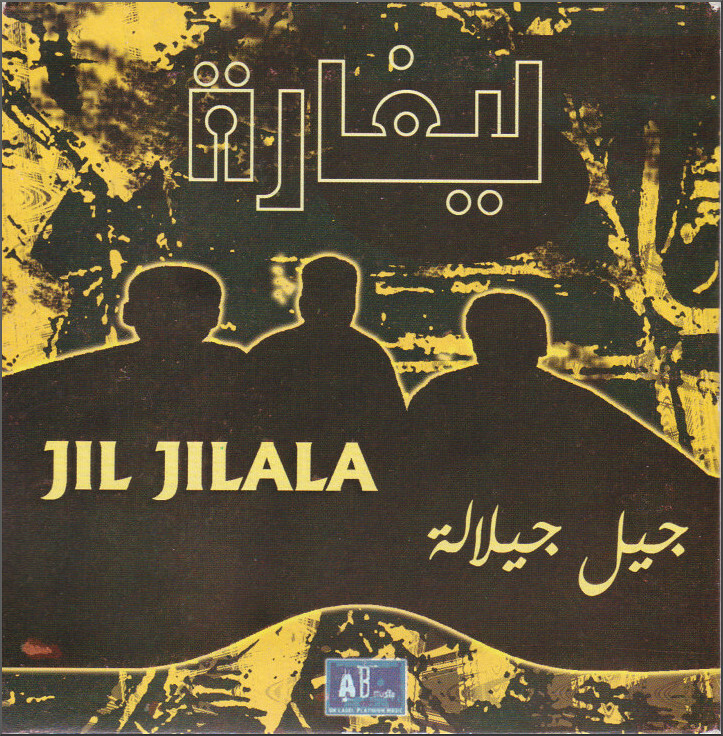 Jil Jilala CD was purchased some years ago in the serendipitously named Bob Music in Essaouira, Morocco. Any copyrighted material is included as "fair use" for critical analysis and will be removed at the request of copyright owner(s). Also on Facebook and Twitter.